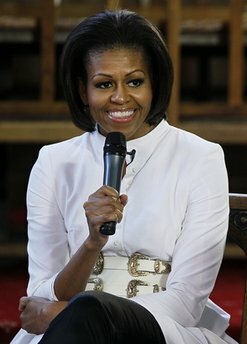 LOS ANGELES (AP)– Michelle Obama is going to be on one of Nickelodeon's most popular shows. The first lady is set to appear on an upcoming episode of the comedy "iCarly" to promote Joining Forces, an initiative aimed at increasing awareness and support for military families, network president Cyma Zarghami said Wednesday. The show's main character, Carly Shay (Miranda Cosgrove), is the daughter of a colonel serving overseas in the military. When Carly's two best friends break some rules to set up a web chat so Carly can speak to her dad on his birthday, "the first lady discovers it and comes to have a chat with them in the most positive way possible," Zarghami said. Show creator and executive producer Dan Schneider wrote the episode just for Obama and her Joining Forces initiative. "When she approached us, after he was done jumping for joy, Dan sat down and came up with a very, very clever idea," Zarghami said. The network president said she wasn't concerned that featuring the first lady and promoting the Joining Forces program would make a political statement for the show or Nickelodeon. "It's a feel-good initiative," she said, "and regardless of your political affinity, everybody cares about these families, so it just feels right." Zarghami says Obama's daughters are fans of the show. The Obama "iCarly" episode is likely to air in January.